The house which had been occupied by a number of protesters at 35 Summerhill Parade. THE Daft.ie report is further proof – as if any more was needed – that our housing system is utterly dysfunctional. Rents are up an average of 12.4pc in the year to June 2018, a period when the inflation rate was just 0.4pc, according to the Central Statistics Office. The average monthly rent, as of the second quarter of this year, now stands at €1,304. This is €274 higher than the peak of 2008. These enormous increases mean that, compared with a decade ago, it costs almost €3,300 more per year after tax just to rent an ‘average’ home. 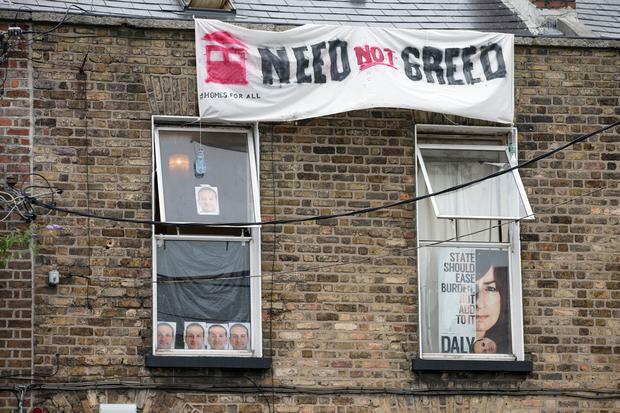 In Dublin, rents are 27pc above peak levels, a period when the rate of inflation has actually fallen. If the housing sector mirrored the rest of the economy, rents should be down, not up. The Simon Community says just 8pc of all properties available to rent in cities and large towns it surveyed are affordable for those in need of State support. The upward price hikes – this is the ninth consecutive increase in which new all-time highs have been set – means the State is spending more to house people in the absence of social homes which are only slowly being delivered. There is a societal price to be paid. Not only are people limited in their ability to save for a home – even if one was available – they have less disposable income to spend in the wider economy, which isn’t good for the country as a whole. It’s hard to put down roots when a rental hike could force you to move, and housing charity Threshold has also warned that people in ‘good’ jobs are increasingly accessing its services to avoid becoming homeless. What does it say about a country when people in work are unable to afford somewhere to call home? The dysfunction is such that families are sleeping in Garda stations, hotels and B&Bs as tourists holiday in homes. While the Daft report suggests that the increase in new housing output seems to be dampening prices in the sales market, it is not impacting on the rental sector. Why? Economist Ronan Lyons says much of the new housing demand will be met by apartments, but few are being built. Last year, some 14,446 new homes were completed, but just 2,264 were apartments. In the first quarter of this year, the figures stand at 3,526 units completed, but just 488 – under 14pc – were apartments. So what’s needed? Certainly not a continued reliance on investor-driven rental accommodation, which commands the highest price the market will bear. New Zealand has banned foreigners from buying existing homes as it grapples with an affordability crisis. Should we do the same, at least for a limited time? The ‘market’ has utterly failed. It’s time for the State to step in and be more ambitious in its response. We’re long enough hearing about cost-rental and affordable rental, but to date only one major scheme has been unveiled. More are needed. There’s no excuse for inaction given the vast landbanks the State controls, coupled with funding being available. What’s wrong with the State providing homes at a fair and affordable price for those left behind? It should be a priority, no matter what your political thinking. The State could also bear the higher costs of well designed apartment living, if it is serious about developing more compact urban areas. It’s surprising there haven’t been mass protests around this issue, given that it impacts on almost all sectors of society – students, those on social welfare, people starting their careers, families, and people in employment. The country is full of ageing parents wishing their 30-year-olds would move out. Perhaps voters taking to the streets in advance of local elections next year might focus minds and bring to an end the price hikes which serve nobody – except the landlords – well.